A child living in the shadow of a famous parent is often difficult, for the child can rarely live up to the expectations of being as great as the parent. So what happens when the child is the flesh of superheroes? Jupiter’s Legacy takes a not-too-unfamiliar story (the days when superheroes have aged into retirement) and put a new spin on it. This story tells how a group of friends follow Sheldon to an island that is not on any maps. There, the youths discover a race of aliens who promise to give the intrepid humans super-human powers. The powers may give these people special abilities that allow them to perform special feats; to rescue; to save, but ultimately, these people are still human — with all the baggage and frustration that entails, such as jealousy and the desire for power. Having served as humanity’s protectors and now aging, Sheldon (aka Utopian) has been the leader of the group, but dissent among them (led by Utopian’s son) brings about some drastic changes. With a coup, a new faction of superheroes takes over and forces changes ‘for the better.’ Not all the superheroes agree with the changes, but because the leadership has absolute authority, the dissenters go in to hiding. It is hard to hide, however, when you have super powers, and when you have children with super powers. I found that this is one of those difficult-to-review books. There moments that I found interesting and enjoyable (more specifically, the second half of the book), and there were times that I just wanted to put the book down and not bother reading any more. The initial set of characters that we meet (Utopian and his friends) never felt heroic or even like-able. This is however, set-up. We’re given the back story, and the moral codes of the main characters — drawing lines, if you will, between the factions of heroes. Perhaps we don’t need this much set-up, though. The situation isn’t that unique. And all the characters in the beginning are despicable … even the valiant Utopian is short-sighted and egotistical. Perhaps if we saw more blending of the characters in the second half, mixed in early, we’d be much more likely to enjoy the journey. The art is interesting. There’s definitely a European feel to the art. I know that doesn’t do it justice, and perhaps even confusing to some. I find the lines sharp and angular and yet the general look is soft and gentle. The coloring stands out as appealing. I really wanted to like this one, and ultimately came away with some good impressions that have me interested in reading on, but I was mostly just confused and ill-enthused early. Looking for a good book? 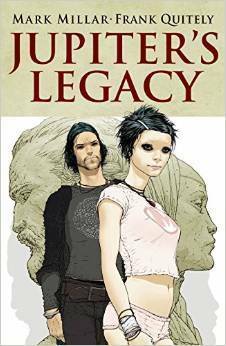 Jupiter’s Legacy is a graphic novel using some older themes (aging superheroes) and struggles at the start to hold the reader’s interest, but eventually develops into an intriguing story.